COCOA BEACH, Florida -- A dead pygmy sperm whale washed ashore this morning on Cocoa Beach, Florida at the beach-end of 11th Street South. Biologists from Sea World Hubb's Research Institute from Orlando, Florida arrived on scene to assess the marine mammal. Sea World officials estimate that the pygmy what weighs about 700 pounds. 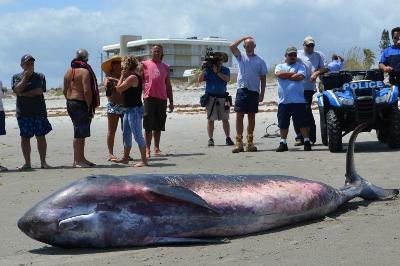 The deceased sperm whale will be buried on the beach rather than taken back to Sea World Orlando. Samples of the whale were taken for later laboratory study. Pygmy sperm whales inhabit all oceans of the world except in the extreme polar latitudes. Adult whales reach around 800 to 900 pounds at full maturity, and are around the same size as their close relatives, porpoises and dolphins.